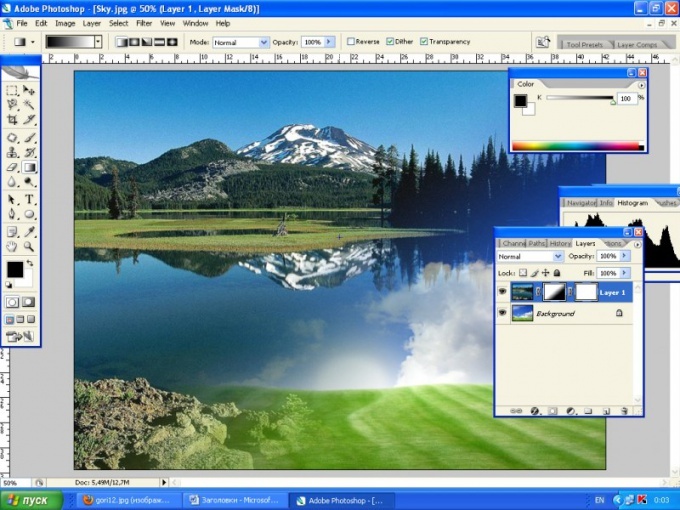 Graphic editor Adobe Photoshop allows you to combine several photobooks in a variety of ways. For this you can apply various techniques and visual effects that require some practical skills in their use. Simple methods that allow you to place one photo over the other or place them side by side available, and an unskilled user. If you want to use one picture as the background, and the second to place in the foreground, start with download Photoshop background photos - drag a file into the editor window. 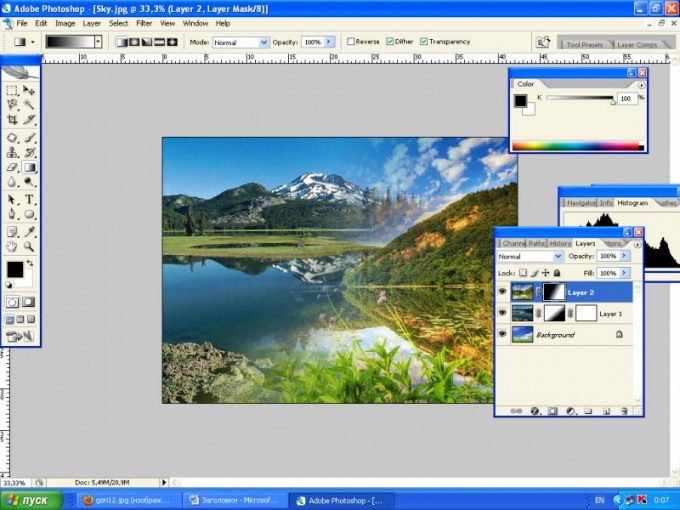 Then create a duplicate of a single image layer by selecting it in the layers panel and press Ctrl + J. All subsequent operations produce a duplicate of the original layer can be useful if something in the process goes wrong. Open the menu "File" and then click "Submit". Opens a standard file open dialog with which you need to find a second photo to select it a file, and then click "Submit". Photo foreground will be placed in the center of the background and Photoshop will immediately include the mode of its transformation. The nodal points on the frame around the inserted image to resize photos. To comply with the proportions and drag the corner points while pressing Shift. 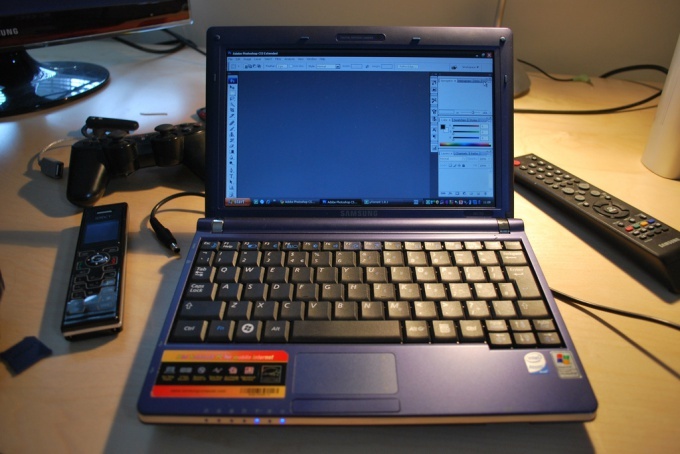 Then the mouse or use the arrow keys to drag the photo to the right place background and press Enter. 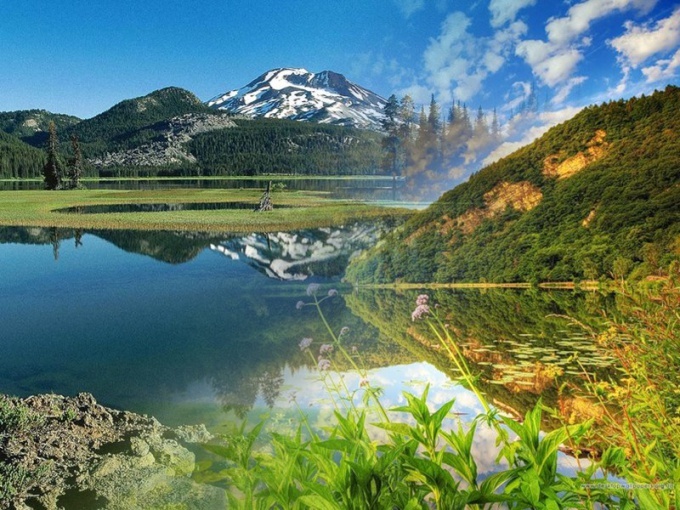 If you decide to put both photos side by side, you will have to change the size of the canvas. Open in the menu "Image" and select "canvas Size" to open the settings window of the operation. You can instead use Ctrl + Alt + C. In the fields "Width" and "Height" specify new values for these parameters, they do not have to be accurate, enter the numbers with the stock. Click one of the layers panel and turn on the Move tool is V. press the Mouse or the arrow keys, move one of the photos to the left edge of the canvas. Then select the second layer and drag it to the desired place with another photo. 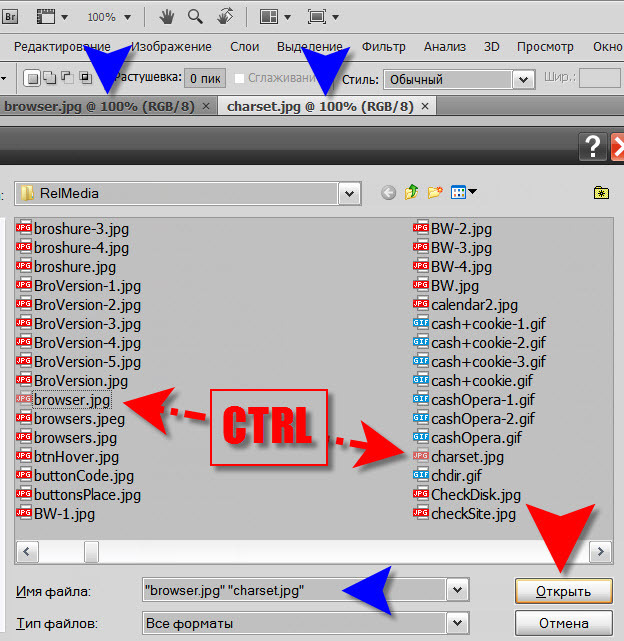 If necessary, adjust the size, with "Free transform" Ctrl + T.
Trim the excess space of the canvas - open in the menu "Image" and select "Trimming". In the settings window of the operation just press the OK button. Save the combined picture with the help of dialog keyboard shortcut Ctrl + S.
Quite often when working in Adobe Photoshop there is a need of combining fragments of several pictures. But how to do it, if you are not so familiar with this photo editor. How to open multiple images? If you need to open pictures in a separate mortgages, go to "File", then click "Open", run the program select images to download in Photoshop. You can do all of this faster, if you press simultaneously CTRL + O. Then select the program desired picture and click it with the left mouse button. On the second selected photo click, previously holding the CTRL button. 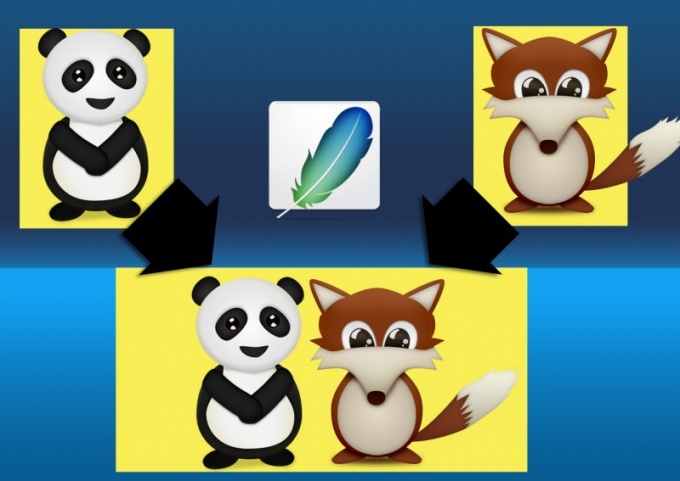 After that, you will notice that in the line "file Name" displays the names of the two pictures. This way you can choose as many files as you need. When all photos have been checked, press "Open" and the selected files are loaded into Photoshop in separate tabs. 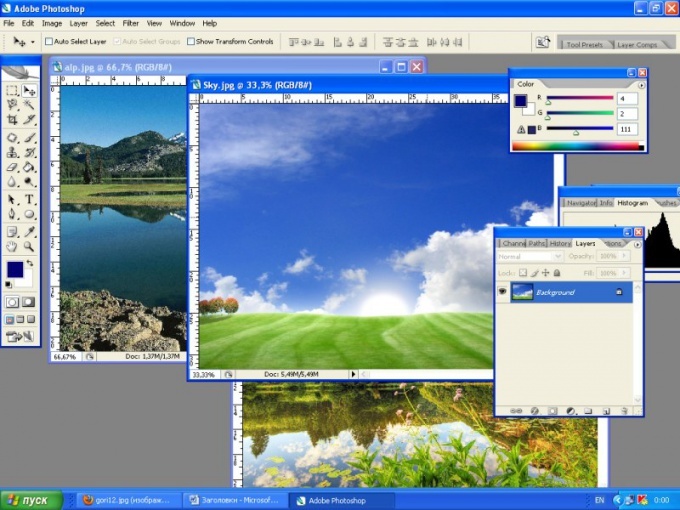 If you have no desire to use the search directly through the Photoshop menu, then open Windows Explorer. Double-click on the icon "My computer" ("PC") or simultaneously press WIN + E. Next, find the location you are interested in photography. Launch Photoshop and turn it into a window so placed relative to the folder with the images to make it convenient to drag. Select photos by holding down CTRL and drag them with the mouse in the editor window. He will open each of the marked photos in a new tab. If you want one photo was placed in another, then simultaneously press CTRL + O and open the first photo. As soon as the editor loads it, go to "File" and click on the "Place". Here again opens a dialog for selecting the file and now open the second picture. After these steps, both photos will be placed in a single layer. You can change the image size by moving the points located in the corners.